Study Abroad: Blog or Journal? What Does A Liberal Education Mean? © 2010 UNC Asheville Office of Admissions. Powered by Blogger. What summer internships do you have this year? I'm not sure yet. I like a lot of things. Some people say sophomores are supposed to have it all figured out... We are supposed to have our majors declared, our internships in line, and know exactly what courses we are taking for our next two years. There are also more realistic people who say sophomores don't need to figure it all out yet. I agree with the latter. Every day I am so thankful for going to a liberal arts school where I can have as diverse courses in my schedule as I want. I can take a New Media class and also a Physics class if I so choose. UNC Asheville makes connections between the departments. I may have a lecture about light and its impact on color in Physics, and then implement that in a project for New Media. What I'm trying to say is that it is okay and normal to have various passions, in fact, here it is encouraged. But I didn't realize this and other facts the day I was panicking that I didn't have everything figured out like all of my friends seem to have. I had made an appointment with the career center to discuss summer internships, and figured that was also a great time to sort through the plans for my major. I have been to the career center before to go over resumes for jobs and have always had wonderful experiences. My most recent trip was no exception. By the time I left my appointment, I had papers in hand about the process of finding the right major for me, what my personality type meant, where I could work to best suit my interests, and application information for summer internships that are near my hometown. Every thing that I had wanted to get, I had left with. An interesting part of the appointment was when the career counselor and I were reading over qualifications for an internship. "Earning a Bachelor’s degree, preferably in journalism, public relations or communications or liberal arts equivalent." Liberal arts! One of UNC Asheville's most proud distinguishers about campus, and here it was in an internship description. Being part of a liberal arts education is something everyone is beginning to notice and takes seriously. It is a recognition to be proud of. Also in the appointment, we used resources that are available to people on-campus such as personality tests, strong inventory tests to see your interests in the workplace, along with search engines for jobs and internships. Best of all, they told me that I was exactly where I needed to be for a sophomore. I was doing the right thing by taking various classes to see what I like, being aware of my interests, and being open to change. Above all, I think that is what I needed to hear, that I was on the right track. Although the snow may have melted away from campus, that did not stop some students and I from finding some more snow elsewhere to continue our snow-time adventures. As you can tell from some of my other blog posts, I am a huge fan of our campus recreation resources on-campus. They have great facilities, group exercise classes, intramural sport teams, club sport teams, weekend trips, day trips, and information lessons. 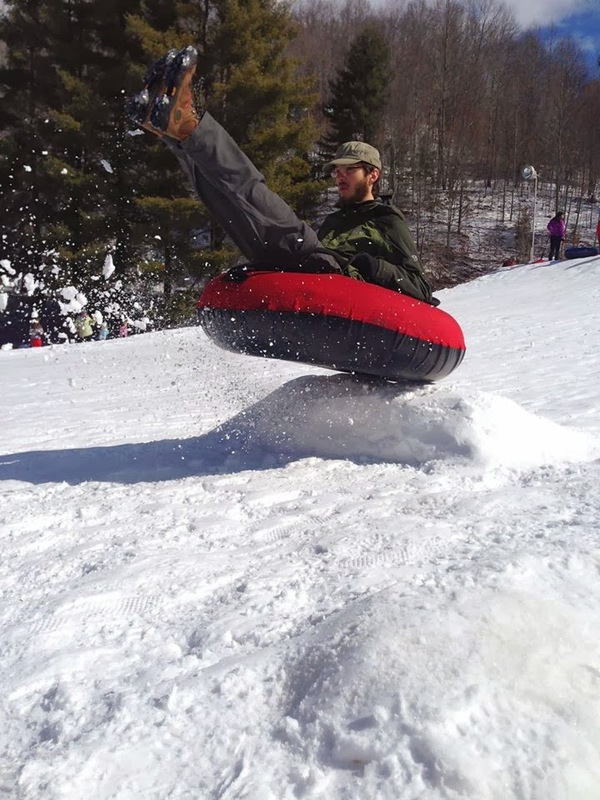 This past weekend my friend and I took advantage of a morning snow tubing trip with campus recreation. The trip was only $25, it covered transportation, instruction, and equipment. We drove out to Mars Hill and were astounded by the amount of snow still on the ground! The sun hadn't touched parts of it, and there was way more than 7 inches. But it was no longer freezing cold. In fact, it was nice in the sun, and you didn't need to bundle up like an eskimo. Perfect snow tubing weather. The location was a local business where it seemed everyone knew everyone. The employees were super friendly, and that added to the experience because they showed my friends and I tricks on the tubes, how to go faster, the best way to ride over a ramp to get air, and other fun things. I think my friends and I did every possible move there was to do on a snow tube... we tucked our feet in, laid on our belly, shared a tube by both sitting in it, and we even went off ramps! College students are just little kids that try looking cooler... sometimes. 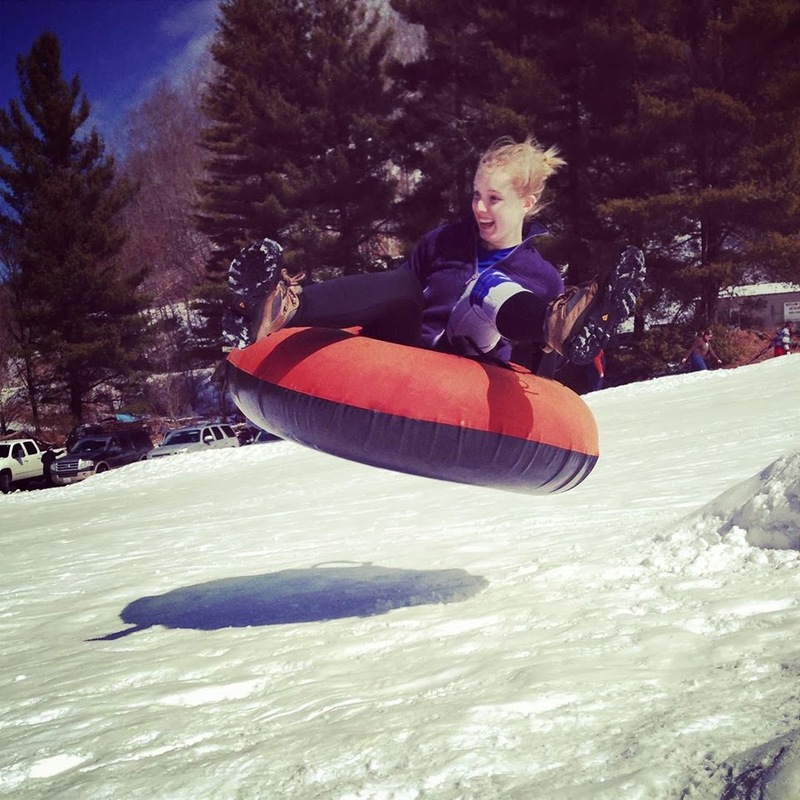 We will never turn down ice cream, the chance to sing, or the opportunity to run around snow tubing for 2 hours. UNC Asheville gives us the chance to let our inner kid run wild while our adult mind grows in intelligence. By the time we drove back to campus early that afternoon, we were worn out. Despite finally going back to class the next day, after days of cancelled classes, the smiles and laughs from snow tubing still remained. It seems all traces of snow have finally melted away. 3 inches, 4 inches, 6 inches, 8 inches... some even said 12 inches. The estimates of how much snow we would have on-campus last week was the talk of the school, and the area. We had almost 7 inches in some areas! Then before you knew it, you looked up and those flurries became globbed masses of snow. Working the Highsmith information desk, people think you know something that everyone else doesn't. People would whisper like it was a secret of the highest security clearance, "...so... are classes for tomorrow cancelled yet?" Whether this question was asked on the phone or in person, I answered it all in the same half-laugh way, "I wish I knew. But I'll find out when you do through the website or email. You can call the snow-line though." Then I would read them the number and direct them to that portion of the site. Luckily the snow did not disappoint, and the beautiful white flakes covered everything in reach. Although classes were cancelled and campus was gorgeous in the snow, people were still moving around just as much as always. With this said, campus was not shut down completely. 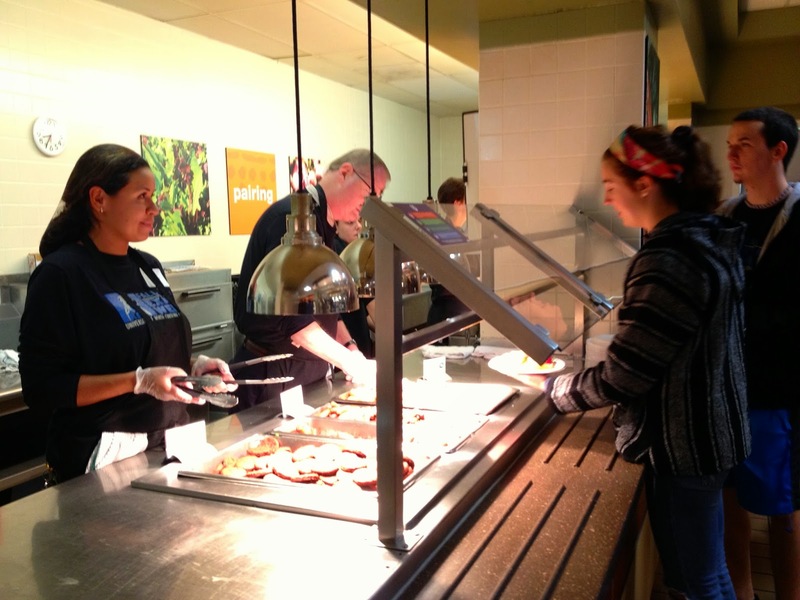 Students in residence halls, such as me, were still able to get hot food in the cafeteria and other places on campus. The workers on campus did a phenomenal job of keeping all the pathways clear and ice-free to prevent slipping and falling. It seemed like the workers were outside around the clock, plowing, spreading sand, melting ice; I applaud and thank them, just as all of campus does. Everything looks more beautiful in the snow, even though the spring will be fast approaching. It's a new semester and a new year, and with these notions come new goals. Although some people have the same goals, such as exercise more, eat better, and so on; everyone differs in their approach. When you live on-campus your resources can seem limited, but you just need to know where to go. Although February is around the corner, and some of you may have stalled on your resolutions, it is never too late for change! Here are some great tips to either get started or keep going. Seems simple enough, right? Your body is composed mostly of water and you need to keep it healthy and hydrated, so drink water. But here are some tips on how to get the most out of the water resources on-campus. 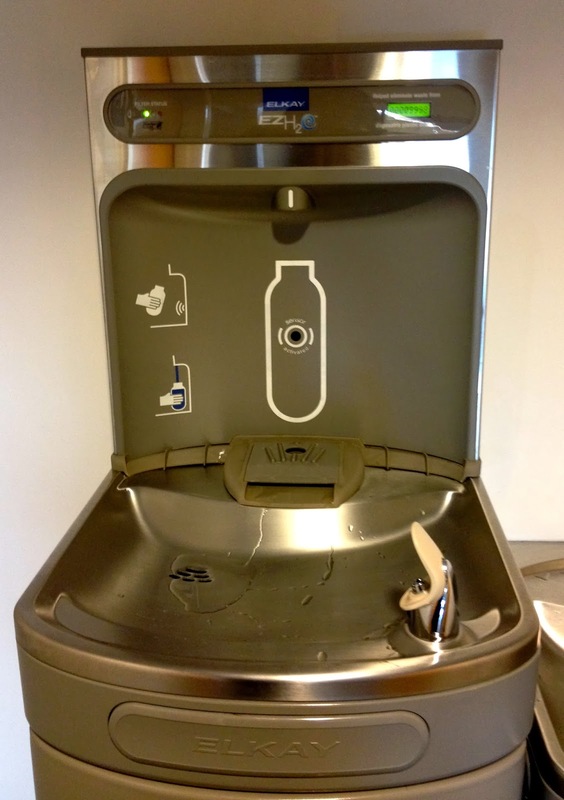 At UNC Asheville we have these awesome machines that are water bottle friendly! They fill your bottle from the top using a motion sensor so you don't have to hold your bottle sideways like traditional fountains. Each time you use these new fountains, it adds a tally point to the counter on its screen of how many bottles are being saved. What a great way to be green and healthy! 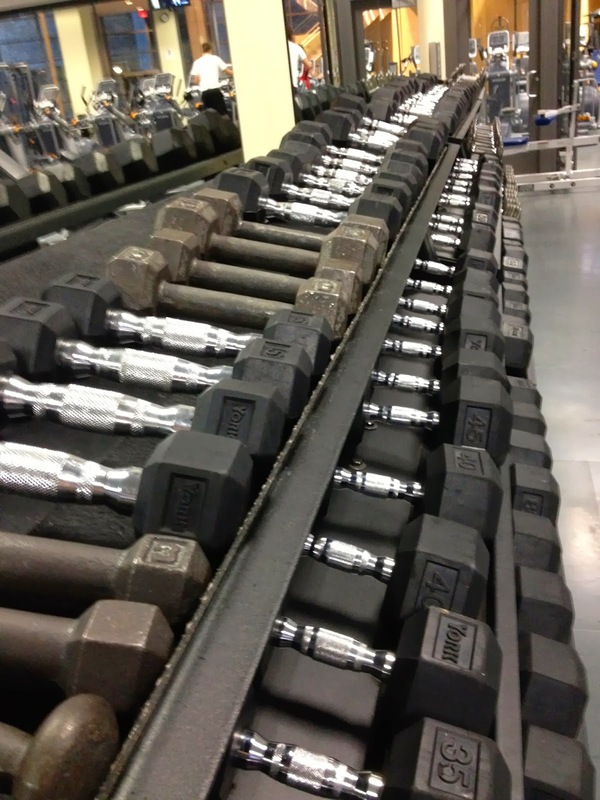 Working out is so commonly thought of as going to the gym and "pumping iron" with heavy weights. Sure that's great for some people, but there are alternatives! 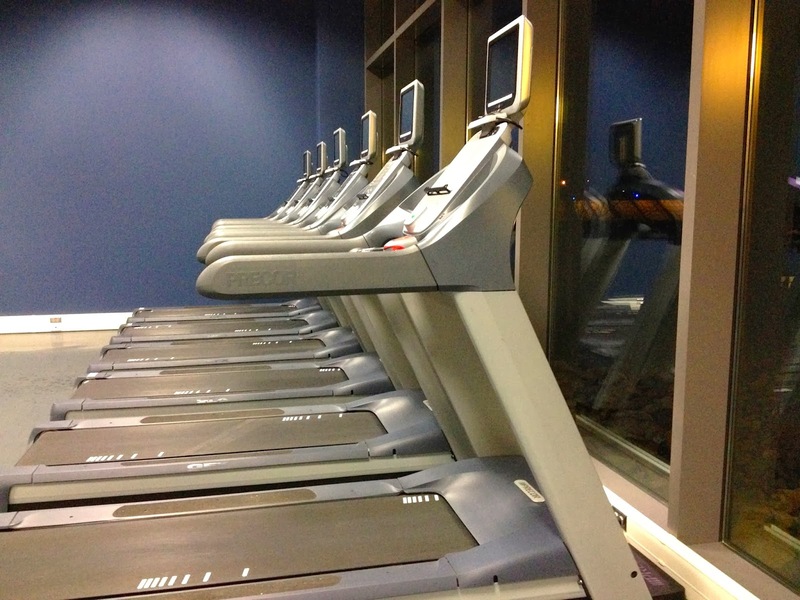 The gym is a great place, with various resources such as treadmills, machines, and weights. In addition, the hours are open from 6am to 11pm most days! So you can definitely find time to work out. But what about a more fun and energetic alternative? 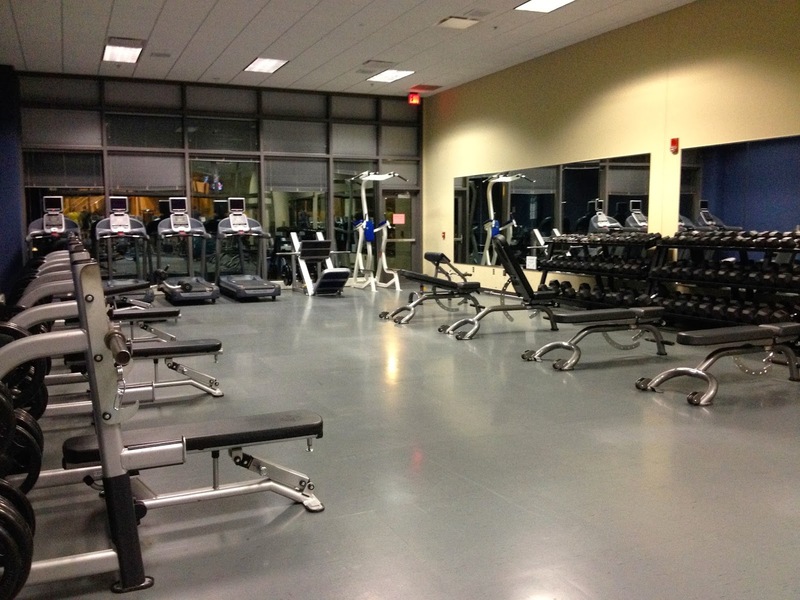 Campus recreation provides free group exercise classes for students too. Here is a schedule of all of them, they include classes ranging from spin and Zumba to abs classes. Click for class descriptions. Or maybe you are just curious about working out, and you want to learn more? Campus recreation is great for that too because they hold informational sessions, such as nutritional information, "how to" classes, and much more. Click here for campus recreation site. As students it is easy to fall into a rut of sitting and doing work all-day long without getting up to get our blood flowing. 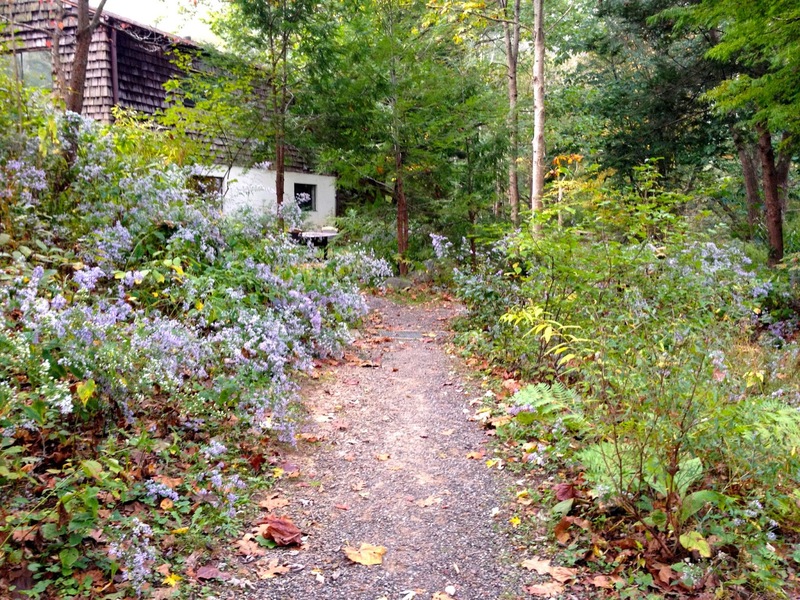 If the previous work out options don't strike your fancy, what about a walk? 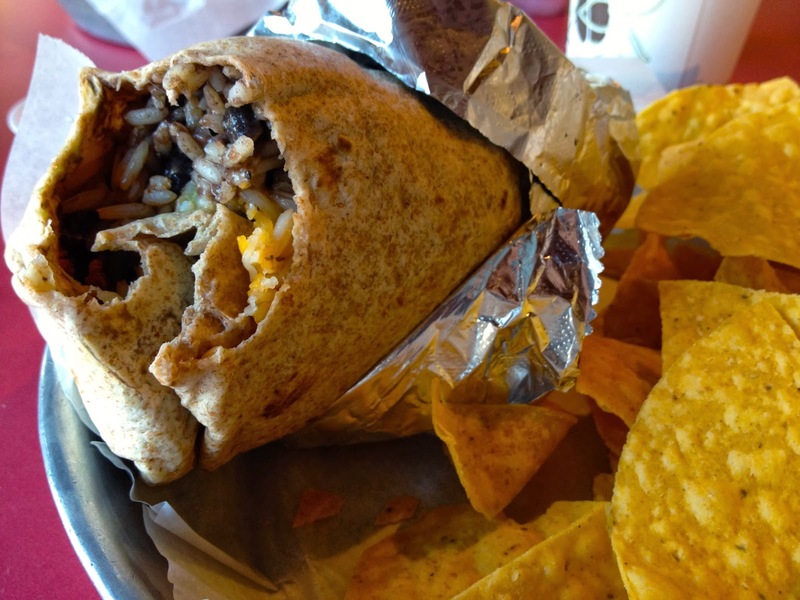 A walk could be to the nearby CVS or Urban Burrito area, or it could simply be around campus. We have some great sites on our campus, from the outdoor art displays in the back of campus to the botanical gardens towards the front - discovering new places is always an option. It's been a couple weeks into school now... feel your blood pressure rising? Not enough sleep due to worry? How about a yoga class? As I mentioned earlier, campus recreation has free exercise classes, but they are not all sweat-inducing. In fact, some of them lull you to sleep. There is even a yoga class called "Yoga Yourself To Sleep"! UNC Asheville has countless options for yoga classes to find the right fit for you, and when you go, you never feel alone because it is a very popular hobby on-campus. So grab a few friends and get your shavasana on. We all understand the woe of hearing the siren song of pizza, fries, and ice cream... Thankfully the food on-campus is delicious enough that we aren't tempted to pig out on unhealthy options. 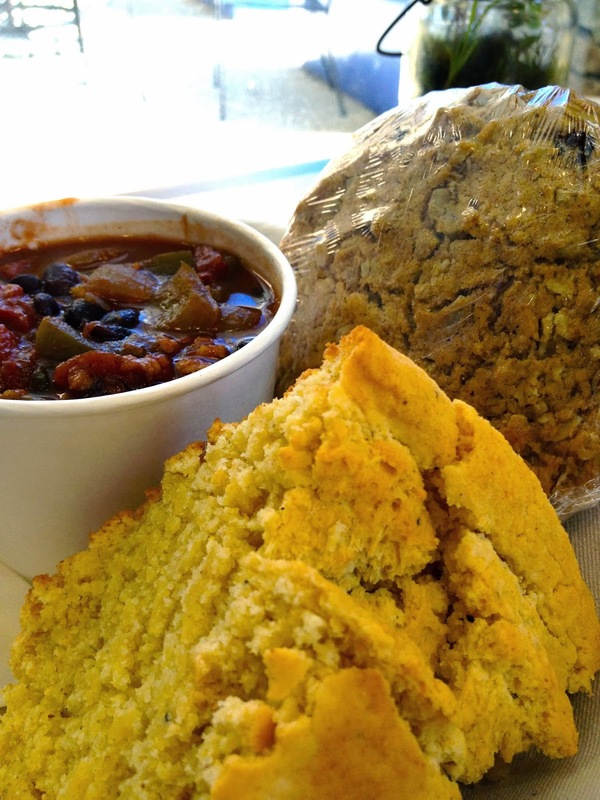 You can get vegetarian chili and cornbread at Rosetta's, pasta with a salad and a breadstick at 2Mato, fresh fruit in the cafeteria, and so much more. One of my favorite things about the cafeteria's food is that they post all the nutritional information on individual cards behind the food. These cards tell you the serving size, calories, sodium content, protein, if they are vegan, vegetarian, or gluten-free, along with other information. 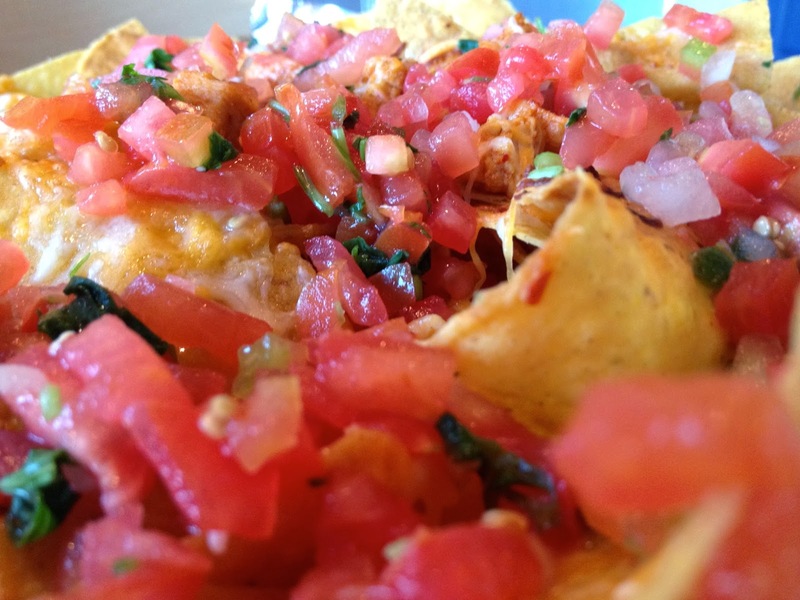 Have a food allergy and not sure if you can eat a certain dish? Feel free to ask! The staff is really friendly and will gladly answer questions. Lastly, but not least... Do something fun! It's college, it is meant to be the best time of your life and it's time to make some memories. You can join an infinite amount of clubs, get a job, hang out in the residence halls, or do some off-campus volunteer work. 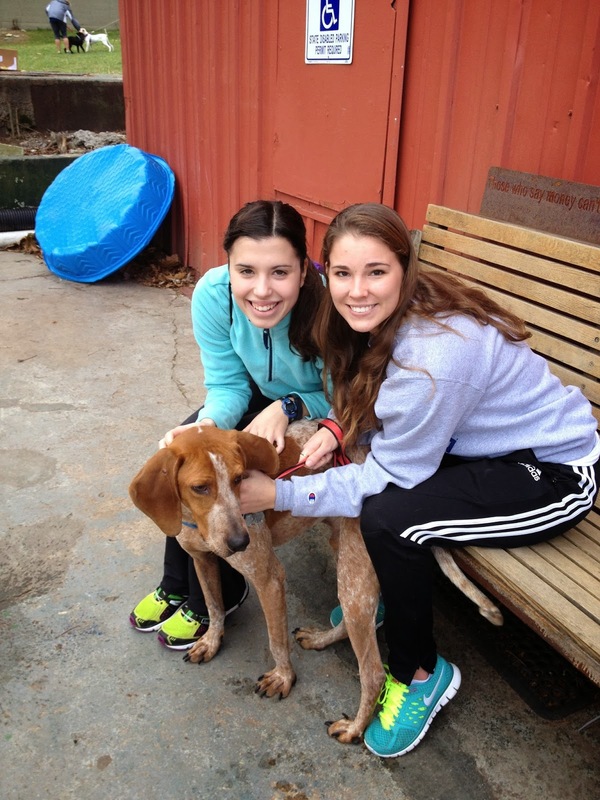 This is a picture of my best friend and I when we helped out at Brother Wolf, which is an animal shelter near campus. Getting out of your room and doing something is easy! So now that I have given you some tips and tricks for on-campus resolutions, go make 2014 amazing! Last Sunday evening everyone returned from their refreshing Thanksgiving break, and were prepared to begin exams. Yet the beginning of exams week would not be exciting without some surprises, such as a raccoon causing a campus-wide power outage. Losing power around 6:30pm on Sunday, we did not get it back till around noon the next day. Although this caused a huge setback, such as cancelling Service Learning presentations, Undergraduate Research Symposium day, and any other campus events. Students persevered and still found ways to complete their papers, trifolds, and presentations. Emergency lights lit parts of campus, and students sought those areas out. Although power had to be conserved on laptops, phones, and other electronic devices, we all managed. After all, we are seriously creative. Yet the creativity did not stop there. Once the power came back on, it was clear that exams were upon us. For most students this meant the final push to get that great grade, stay up all night, ace that three hour exam, all while managing stress levels the best they can. Thankfully, campus and its faculty does the best it can do to ensure that students allow themselves some study breaks. After all, your brain needs to have some fun. 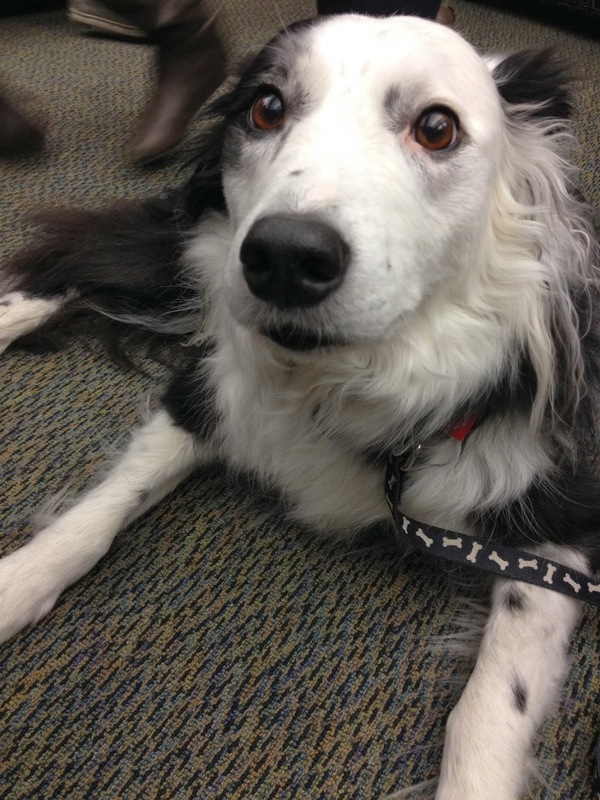 - Therapy Dogs: These dogs came to campus two evenings in a row in the student union, allowing students to pet, hug, and de-stress with them. For all of the students without pets on-campus that miss their furry friends back home, this was a wonderful way to feel like they were home again. There were numerous breeds, from big dogs such as yellow labs, and smaller dogs such as schnauzers. It was obvious that each student gravitated towards certain dogs and stayed there most of the event. For instance I have a border collie at home and was thrilled to see one there. - Exam Breakfast: Every year on the first night of exams, from 8:30pm-10:30pm, the cafeteria opens its doors to the entire student population, allowing them to come for hot breakfast foods, karaoke, and a time to relax. 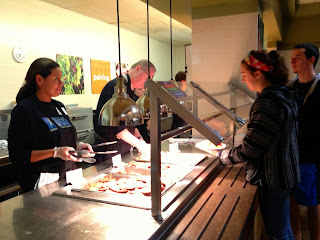 The added twist is that the food is served by faculty members. This means that the same professor who may be giving you an exam in a few days may be first giving you a hot biscuit and some strawberries. Needless to say, the event was packed. The way students line up outside the cafeteria in anticipation is closer in excitement to a concert than a breakfast. My friends and I got there at 7:50pm to wait in line, and by 8:05, the line wrapped around the bend, and past the entrance to the student union building next door. 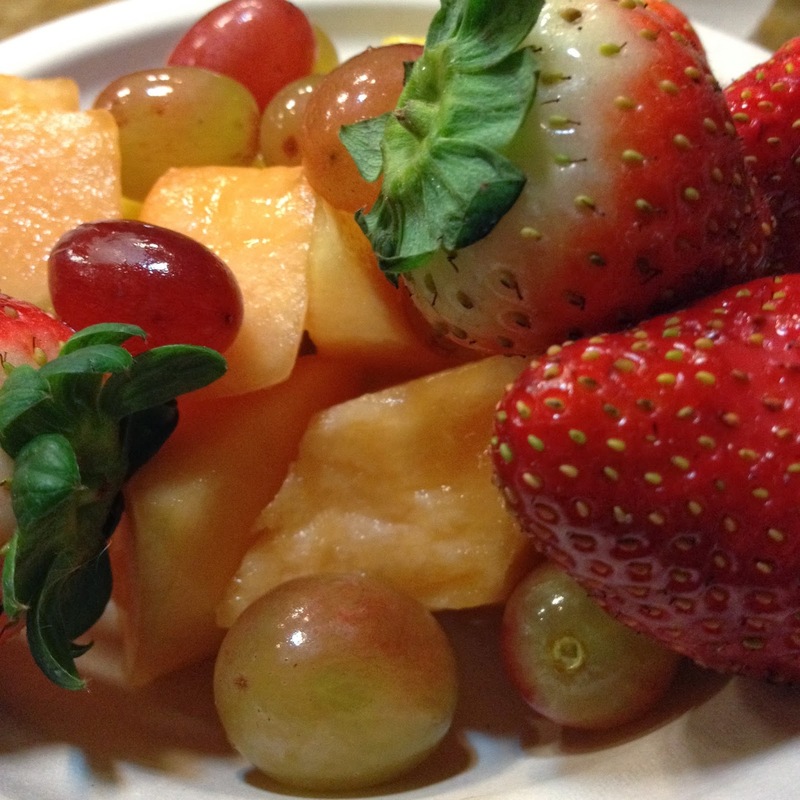 The evening was filled with delicious foods such as pastries, pancakes, fruit, and biscuits. All this food was served with karaoke performed by students. It was a great way to unwind and catch up with friends. - RA Trip to Chocolate Lounge and "Elf" Movie Night: Resident Assistants (RAs) have the power to help students on their hall as much as possible. During exam week it is crucial for RAs to make sure their residents are not having a difficult time. My RA decided to take me, and her other residents on a trip to the French Broad Chocolate Lounge and then host a movie night for "Elf". Who doesn't love chocolate and some holiday cheer with Will Ferrell? - Rented movie from library for my own movie night with friends: The library is a great place for studying, finding books, or getting a quick snack at the cafe. What a lot of people do not realize though is that you can rent movies, other than documentaries, from the library too! Movie titles available range from the "Iron Man" series to "Monty Python". My friends and I decided on "Silver Linings Playbook". Rentals are for three days. - Highsmith Study Spaces and Study Snacks: Want an area other than the library or your dorm room to study where you will not be bothered? Want late hours with free snacks available? Highsmith, the student union, offered numerous rooms with couches and desks for study spaces during exams. The building was also kept open till 3:30am and various snacks were offered such as coffee, hot chocolate, granola, and cookies. Overall, campus came together to make exam week as painless as possible. I am so thankful that I go to a school where these activities are made available and that we also have an exam schedule that is bearable. UNC Asheville is the only public university that only has exams on weekdays. Other universities, such as UNC Chapel Hill, have exams on Saturdays because their campus is so large they need the extra days to fit all the exam times in. I glance at the clock and see that it is almost game time, the first game of the basketball season, an exhibition game versus Brevard. 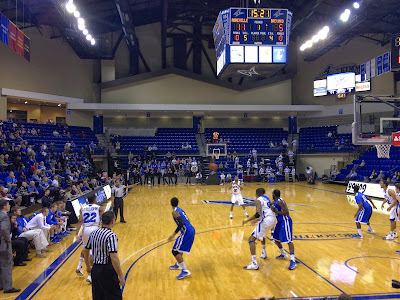 I rush to Kimmel Arena to take my place among my peers in the student section of the stands. I love basketball season, everyone gathers together under one roof to cheer the loudest they can for our school to claim victory over the visitors. This year though, I love basketball season even more. Last year the players were these far-away students that I didn't know off the court. 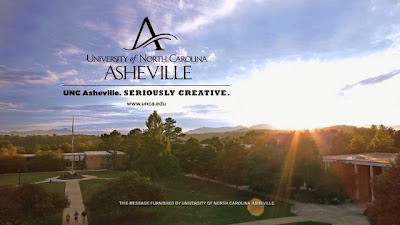 But then, due to the size of the UNC Asheville campus, I had classes with a few of them and got to know them. UNC Asheville is great because the athletes aren't separated the way they are at some larger schools, they aren't above anyone, you can always talk to them. Now knowing some of the players made attending the game that much more fun because I could now tell them good luck, cheer for them specifically, and tell them great game. 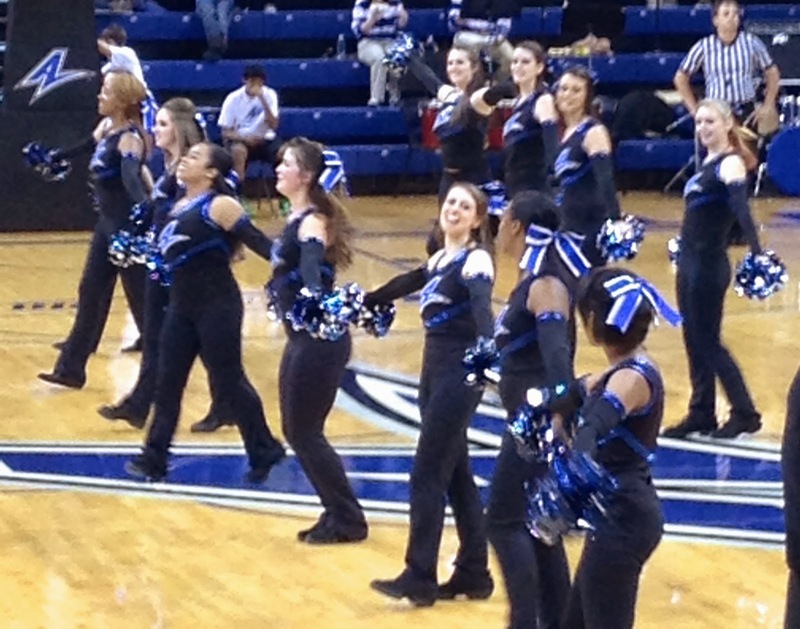 Basketball isn't complete though without cheerleaders. UNC Asheville's cheer and dance team pumps up the crowd the entire game and dances during the breaks. Once again, last year I didn't know a lot about the cheerleaders, but this year one of my best friends was dancing with them. Talking to her throughout the process of becoming a cheerleader, I gained some more insight into what fuels our school spirit. There were auditions, then after you make it, routine practices to make sure you have the dances and the cheers committed to memory, and then finally game days. They do not travel with the team, so they give their best energy to home games, just like the fans. All of this energy and spirit is consuming if you are in the arena, but if you cannot make it, don't worry, you can always watch the game online. My mom watched it online at http://www.bigsouthsports.com/live/6620 and was texting me throughout the game, saying what a great job the guys were doing. They were doing a great job! Seeing some of the players in class all the time made it hard to remember that they were athletes but then seeing them play... it was obvious. Corey Littlejohn, who I had "Physics of Light and Visual Phenomenon" with last year was playing an amazing game! Shot after shot, they all went in. His teammate, and also a previous physics classmate of mine, Jaleel Roberts also had a great game. Everyone on the court proved that they had been practicing their hardest in the offseason. The final score of the game. The first game of the season was over with a win. Later this week the guys will travel to Kentucky, and then later Duke, and many more. Their next home game isn't until December, but the fans will be ready for when they return. Maybe it is just Asheville, or maybe it is college students in general. But there is a deep allure associated with Halloween and its social allowance of children and adults to dress up as anyone they wish to be for an evening, and enjoy a week where every event, including the scary ones, comes with candy. 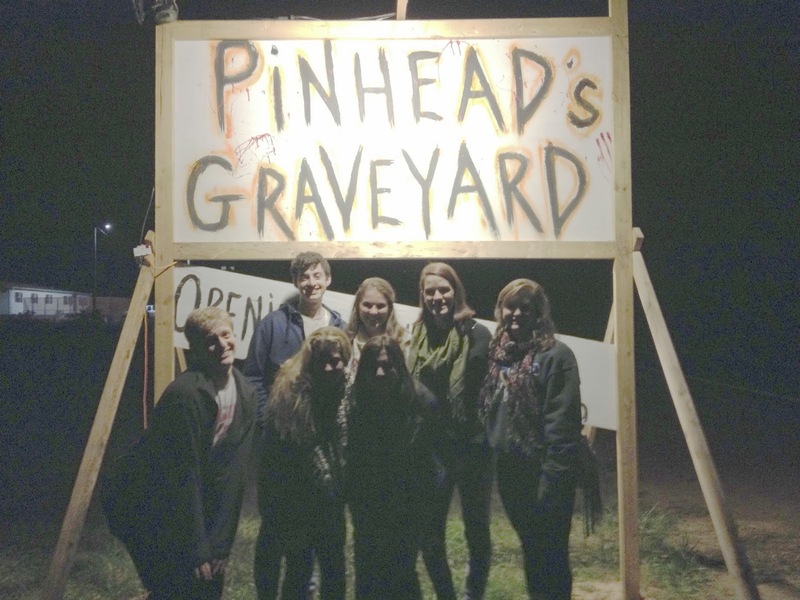 On the UNC Asheville campus, the week was packed with events - costume contests, free frozen yogurt, pumpkin carvings, a haunted maze, "Scream" movie night, and a corn maze trip. All of these events were free. Campus does a great job of making sure that students are not bored, that there are options of things to do on and off-campus. When an event is offered off-campus, transportation is provided so that students who do not have cars, such as myself, are not excluded. 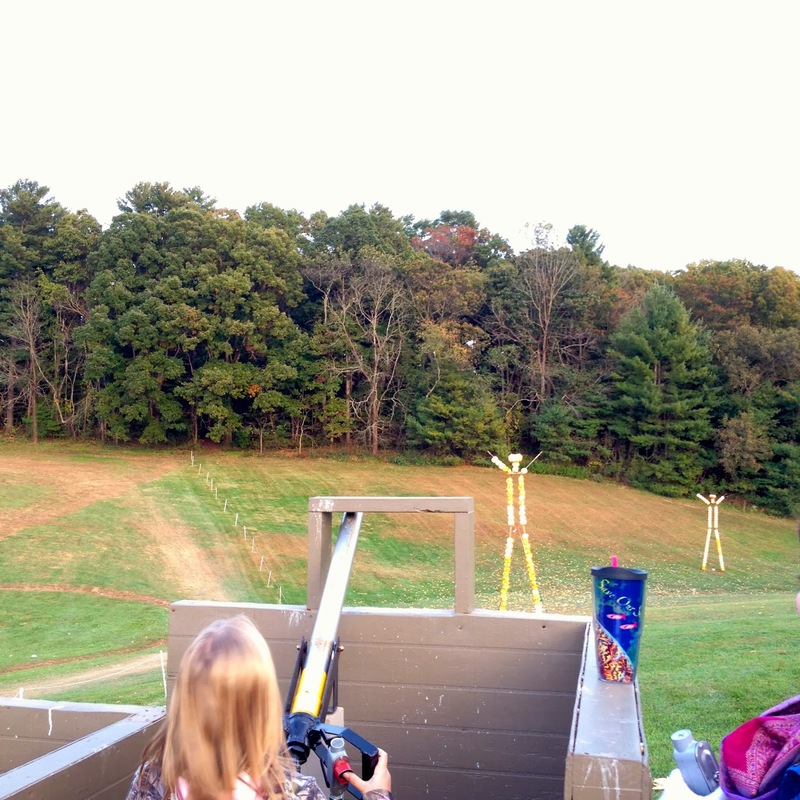 The first event my friends and I participated in for the week was the Eliada's Home Corn Maze. The trip was free to the first 20 students who signed up. Myself and two friends successfully made the list. It was an evening trip to the maze, which included activities such as corn hole, hayrides, giant slides, and shooting ears of corn at pumpkins in a field! The maze is the largest one in Western North Carolina, and it, and the other events the field hosted, did not disappoint. A couple of nights later, I volunteered to help with "Haunted Highsmith", a night in which the student union building is filled with Halloween events: pumpkin carvings, novelty photos, wax hands, costume contest, and a haunted maze. I was assigned to help in the haunted maze. At first I was a bit weary, not knowing what I was going to do. 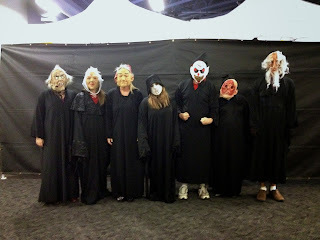 But after meeting my fellow volunteers and taking a tour of the maze, I was excited to scare my peers. 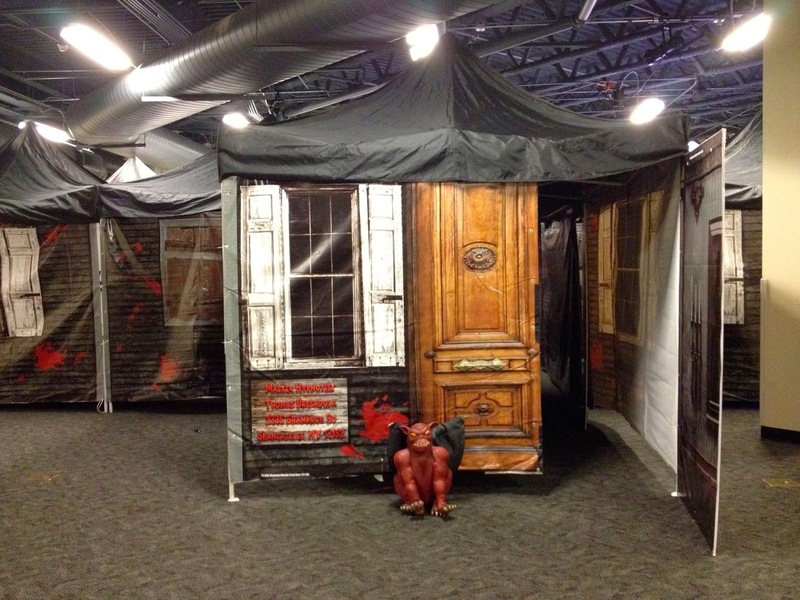 The maze was located in one of the large rooms that hosts events; it was constructed out of support beams, patterned tarps, strobe lights, dolls, and fake blood. 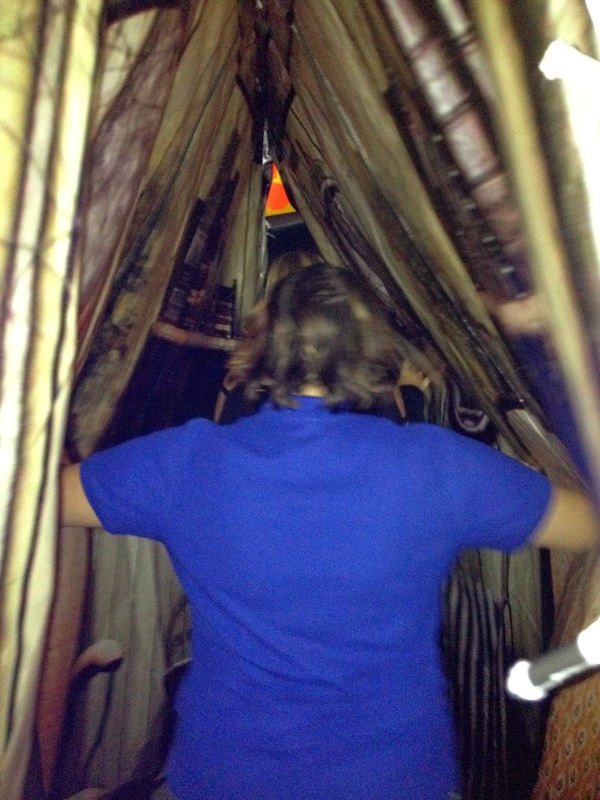 As a volunteer, I got to take a tour of the maze with the lights on to learn the hideaway corners where I could stand in my "Scream" costume. The maze was eerie even with the lights on! It had all the stereotypical rooms. 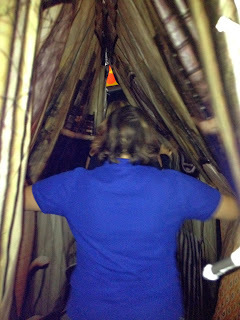 But what I didn't expect was a claustrophobic tunnel in which tarps were pressed together and you had to squeeze through. The event lasted for about 2 hours, and the maze successfully scared over 150 people. I recognized athletes, classmates, and friends alike. I could see them, but they could not see me, my mask concealing my identity. Everyone that came out that night had a blast, and I loved seeing the smirks on people's faces when I told them which character I was. I love Halloween and cannot wait for next year. I scurry down the stairs of my residence hall, Governor's Hall, to the first floor lounge and kitchen area to interview my RA Hallie Banish. Even standing outside the door of the lounge, I can smell the cupcakes being baked. I walk into the kitchen to find Hallie teaching a resident how to bake cupcakes from a box but add homemade touches so as to save time as a college student, but still pour love into the batter like any great baker. The cupcakes of choice for the day were vanilla with a cookie dough base and kit-kat candy bar stuffed in another. No recipes from Pinterest, solely creativity. Hallie sits down with me to answer some of my questions while watching over her shoulder to monitor the cupcakes. 1. Tell me a little about yourself. What year are you, what's your major, where are you from, and do you have any siblings or experience that prepared you to be responsible for other students? - Hallie is currently a junior majoring in philosophy with a focus in pre-health. She is from Hickory, NC and has experience being responsible for other individuals because she has taken care of her younger brother her entire life since she was old enough to stay home alone. 2. When did you become interested in being a residential assistant, also known as an RA? How? - Like most incoming freshmen students, Hallie had a rough transition period where it was hard being away from home along with all the new experiences and responsibilities that accompany being a first-year college student. Luckily her RA, Daniel Bradley, was amazing at his job and really helped Hallie adapt, allowing her to become better acclimated to the college settings. Daniel and her had a lot in common, allowing them to become friends over shared interests such as skiing. During that year as a freshman, Hallie thought that if she could be helpful and kind to someone like Daniel had been to her, it would be amazing. There are so many people who need help in different areas, maybe it's schoolwork or perhaps it is that initial transition period. After first semester of her freshman year, Hallie was hired as a programming assistant and fell in love with the work. 3. After hearing your comments about Daniel, how would you define a good RA? - Being a great RA isn't about hosting the most events and being extravagant. Instead, a great RA is about making your residents comfortable, for them to know that they can come to you for help or anything, whether it is a social question or a roommate conflict. Creating an open and safe space is crucial for open communication between an RA and their residents. 4. Explain a bit about how to become an RA. - In mid-spring semester there are a bunch of emails and ads out on campus about becoming a residential assistant. To begin the process in becoming an RA, you must attend the interest meeting that is held. From there, you then sign up, turn in an application, have an individual interview, and also a group interview on a separate day. This is all about a 3 week process. Before the end of the year, you are notified if you have been chosen. Training is 2 weeks in the fall, and then 1 week in the winter. 5. Do RAs choose the residence hall they live in? - When chosen as an RA, you put down a preference of a residence hall, but then you have to explain why you think you would be a good "fit" for that residence hall. Similar to how the school pairs roommates based on personality, they also try to put RAs into residence halls in which they would thrive. For instance, an RA who is outgoing, social, and perhaps is more comfortable interacting with athletes will be placed in Mills residence hall due to the more social layout of the residence hall. On the other hand, an extroverted RA may prefer movie nights and social events within the residence hall may be placed in either South or West Ridge due to their quiet and secluded style. 6. Over your years working as an RA, which has been your favorite? Which your least favorite? - Every year has their own pros and cons, they are all very different. As a freshman and a sophomore, Hallie worked in South Ridge, which is one of the quiet residence halls that hosts mainly freshmen. She enjoyed this hall because it is heavily based on community due to their multiple study lounges and common rooms. 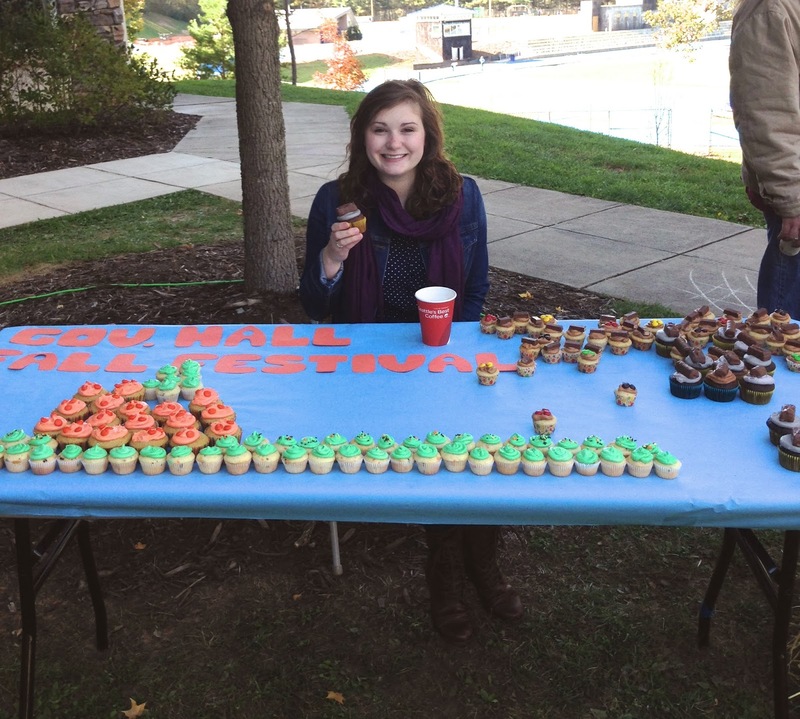 Now, as a junior, Hallie works in Governor's Hall which is an upperclassman residence hall. Due to it being an upperclassman dorm, it is not as community based and does not have as many common areas. What drew Hallie to this residence hall was the notion that a lot of upperclassmen are left to be by themselves since they are no longer new and sometimes confused freshmen. Therefore this year Hallie wanted to try and account for those residents. 7. Every week you invite your hall's residents to join you for "Theatre Thursdays" in your room, where you bake us cupcakes and have a movie to watch. You also plan events outside of this weekly one, this is more than most RAs do... Why do you make so many ambitious plans? - Hallie's simple answer to this is that RAs are friends too. They want their residents to view them as peers, and not solely as an authority figure. Friends have each other over for movie nights and bake cupcakes. 8. How did these ideas come to you? - At the beginning of the year, Hallie had all her residents fill out a survey sheet to gauge their interests such as hikes, movie nights, or creating artwork. These answers are what have fueled her events so far. For instance the haunted hike she planned (see Haunted Trail Trip with My RA blog post) was for the outdoorsy people. Weekly movie night is for the ones that wanted to watch movies. Lastly, she converted the columns in the residence hall into chalkboards, which the residents can draw on, for the art lovers. Hallie tries to make sure that there is something for everyone, and that no one is left out. 9. Any other comments you feel people should know about you, or RAs in general? Such as, is it worth all the training and time commitment? - Being an RA is hard sometimes because you become friends with the residents and then they mess up and you still have to deal with them in a professional manner. Despite this setback, Hallie still slaps her knee and proclaims "TOTALLY WORTH IT!" Every floor of every residence hall has an RA, which is short for Residential Assistant. Some large floors, such as ones in Overlook residence hall have two. RAs are students whose job it is to help their residents with campus questions and maintain their safe living conditions. Rather than acting solely as an authority figure, they are also supposed to be able to be approached as a peer. The most apparent way for RAs to gain peer openness on their halls is by organizing events and hall meetings. For instance my hall theme is Candyland, so our first event tied into the idea that if we achieved certain tasks on campus, we would gain points similar to the board game, and ultimately be able to win prizes. Last night my RA, Hallie Banish, decided to team up with another RA to organize an event that would celebrate the approaching spooky holiday of Halloween. The trip consisted of a meal at Cookout and then a haunted hike at Pinhead's Graveyard in the mountains of Asheville. Transportation was provided by the RAs, you only needed to bring your own money for food and the trail - a great deal considering my friends and I do not have cars on campus. My friends and I all bundled up tight against the night's brisk air on the mountain trail. Before we prepared to have a good scare, we all enjoyed milkshakes along with other various treats at Cookout. Then we all climbed back into the cars for a 20 minute car ride to an area of the mountain where there were no street lights, only winding roads sprinkled with dim lights from houses. Then as we turned one bend, we saw the Pinheads sign... the blood red font seemed to drip off the sign that was dimly lit by a light from overhead. Before crossing the gate into the trail, the guys in the group puffed out their chests with fearlessness and tenacity; while the girls, including myself and my RA, huddled together like sheep, trying to find solace in the group mentality, avoiding being stuck on the ends of the group for the unease that comes with being jumped out at by characters of nightmares. A little while later, we all made it out unscathed. We all agreed that it wasn't as horrifying or bloodcurdling as we thought it would have been, allowing the girls and I some relieved laughter while the guys complained about wanting it to be longer. Although the trail itself was not tear-inducing or had us checking behind our backs us as we left, it didn't matter that much. What did matter was that my RA along with another one, joined forces to bring my friends and I, along with other residents, a fun Halloween event that allowed us to get off campus and have some laughs! The trail didn't need to be that scary for all of us to still have fun hanging out together and getting to know new residents from school in the group. But we will remember how funny it was when the masked man flaunting his chainsaw did not make my friend, Brian, so much as even flinch. RA sponsored events such as these are one of the many perks of living on campus, and being able to join a group of peers for a fun night out. and the café will not suffice. 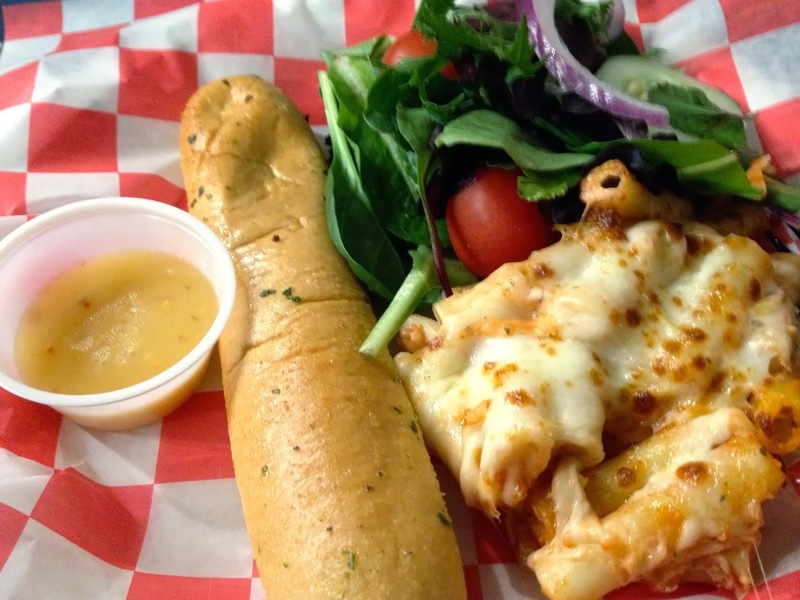 There are countless yummy food options within an easy walking distance of campus, such as Luella's BBQ, Circle in the Square Pizzeria, Urban Burrito, the Hop, Rise n' Shine, and Asheville Pizza and Brewing Company. For all of you fellow vegetarians looking for something with some flavor, do not fear because all of these restaurants, even Luella's BBQ have vegetarian options. BBQ tempeh anyone? All of these eateries are enticing in their own way, my close friends and I having tried all of them before. Yet some other friends of mine had not tried Urban Burrito or the Hop, so we decided it was a night for new things. The walk there always seems rather short when venturing with friends to chat with. The food also helps make the walk worth it. Maybe a "Greek" quesadilla that was stuffed with feta cheese and spinach, or a burrito filled with jerk tofu? All of these various options from chicken to tofu, and plain tortillas to jalapeño flavored, is perhaps why the restaurant has the word "urban" in it - because it goes beyond your stereotypical walk-in Mexican restaurant. Yet when it came to be my turn to order, I froze and ordered my usual. A whole-wheat tortilla filled with black beans, rice, cheese, guacamole, and sour cream with a side of chips. May not have been the most original meal - but their salsa shakes things up. Lime pineapple, jalapeño hot, mild... take your pick. After my friends and I finished our Mexican cuisine, we headed down the stairs of the complex to the ice cream shop, the Hop, which is owned by an UNC Asheville alum. All the flavors, vegan options included, are homemade and UNC Asheville students receive a discount when they present their Onecard student ids. Ones we have come to see in every ice cream shoppe to ones that call for another glance. 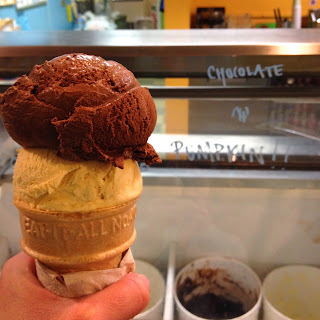 I chose two scoops - one chocolate and one pumpkin, to celebrate the coming of fall. 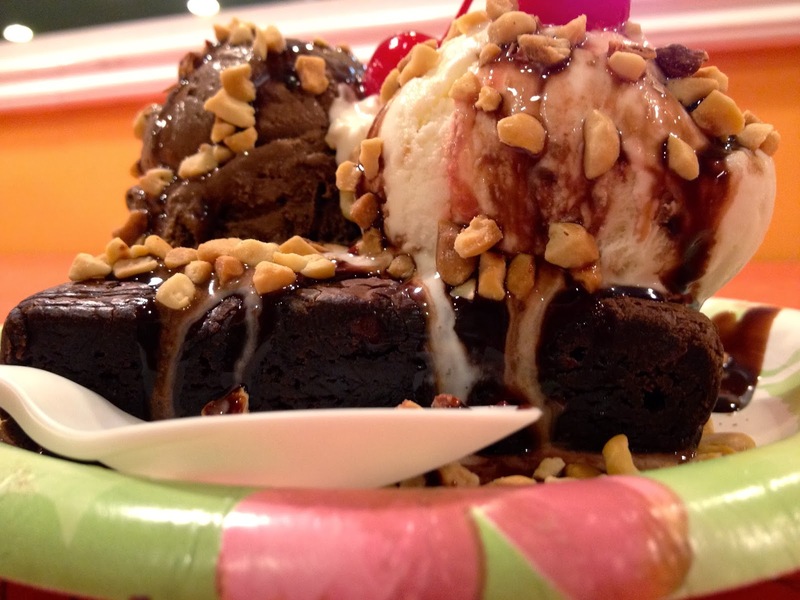 Meanwhile, my friend picked a brownie accompanied by scoops of ice cream and decorated with whipped cream. After a long week, it was nice to end on such a sweet note. Imagine yourself in a vibrant community where learning is active, multifaceted and above all, personal. 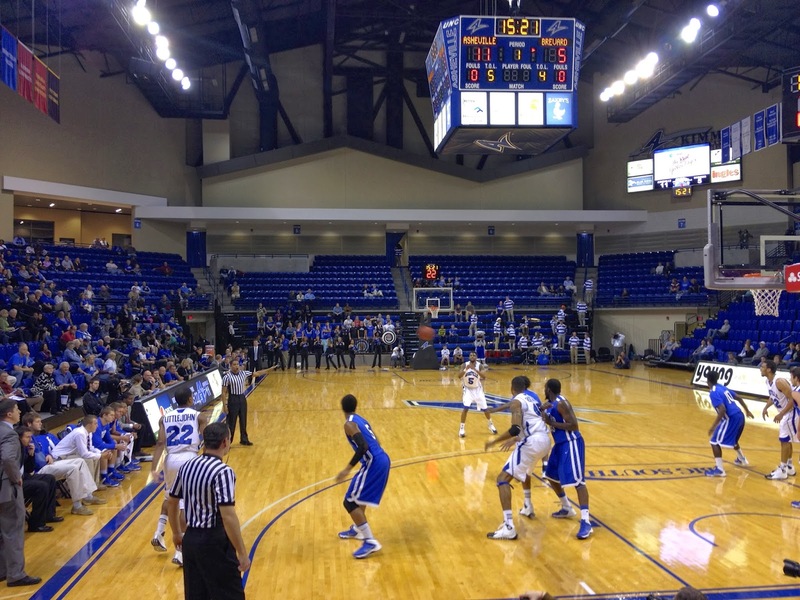 At UNC Asheville, classes are small, so you won’t be a nameless face in a crowded lecture hall. Instead, you’ll be digging into issues that matter, guided by professors who take the time to support and motivate you. Our hands-on approach gives you a new way of thinking through an integrated core curriculum — and opportunities that are normally available only in grad school. Here, you’ll engage with ideas, put them in action and use them to launch your own future. 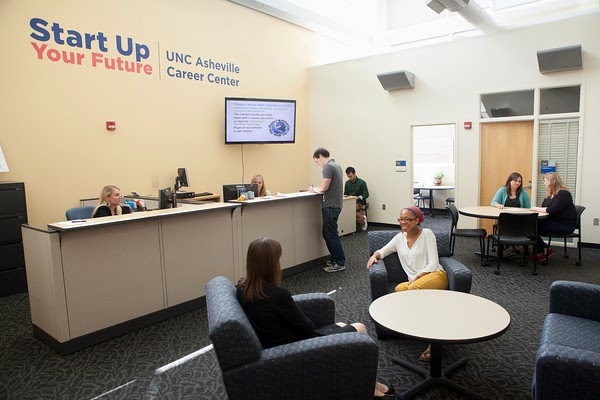 Your UNC Asheville experience, both in the classroom and out, will prepare you for a wide range of possibilities. Our graduates say that thanks to their UNC Asheville education, they were ready when new doors opened that they hadn’t expected. And in today’s marketplace, that’s a definite advantage.